Apple frequently files patents with the USPTO, and while many fail to bear any kind of fruit, some offer a unique insight into the company’s future plans. A recently published filing is of particular interest, since it details a portable device featuring a wrap-around AMOLED display, built entirely from glass, and also including a face-tracking feature. More info and images right after the jump. The wrap-around design of the device and its screen would allow for every inch of the display real-estate to be utilized, and the AMOLED display appears would essentially fold out onto a transparent surface area. The form factor of the device itself is rather unique, and although it takes a shape remnant of a flattened toilet roll, does appear as though it would be relatively comfortable to hold. As well as presenting a device with a rather striking look and feel, the patent also includes information on technologies such as facial recognition, along with layered transparent displays which could potentially offer a 3D effect. Pretty fancy stuff we must say. 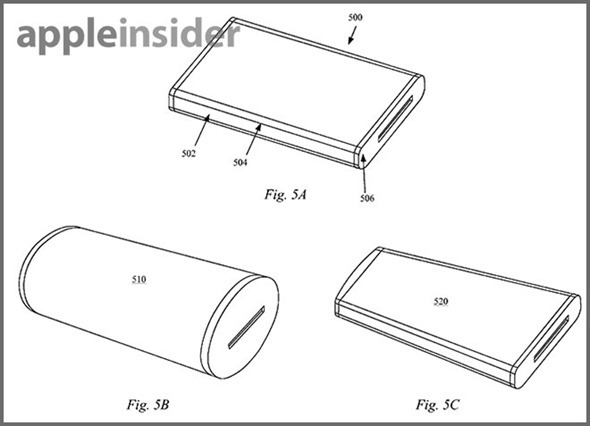 The unfolding element of the display, which would be housed inside the device, is certainly the marquee feature, and since there’s also potential for the display to be folded into one continuous band, graphics, videos and photos would reveal a lot more when compared to the current, flat displays on the market. The design is such that no switches or buttons would be present whatsoever, and instead, the gadget would be controlled by gestures and such. Yet since the display would wrap the device entirely, the face detection system would be a required implementation to track and interact with the user. To elaborate on the aforementioned layered, transparent display feature, different layers would work in conjunction with each other to give the impression of three dimensions. For example, if two layers were projecting the same content but one was slightly behind and or blurred, the output seen by the user would be 3D. The patent was originally filed in 2011, and while history suggests that some, if not all of the technologies may well never see the light of day, they certainly raise an eyebrow or two. 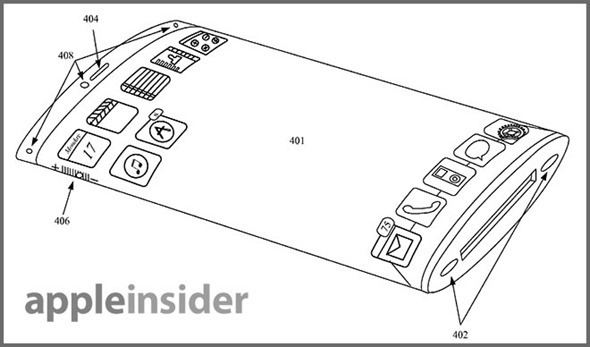 Could Apple possibly bring a folding, AMOLED display to a device such as, say, the iPhone?